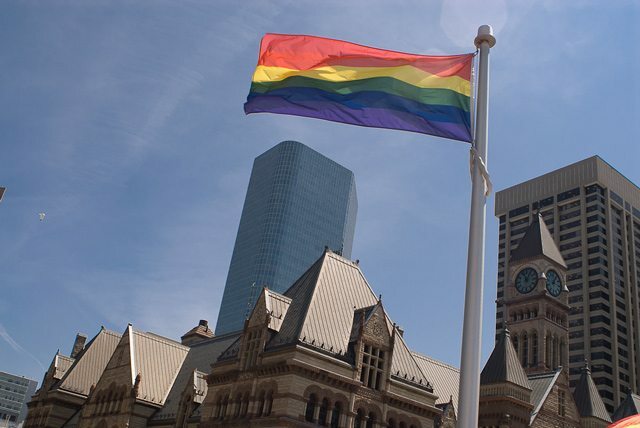 City Council Reaffirms Support for Pride Toronto, Condemns Term "Israeli Apartheid"
The rainbow flag at Toronto City Hall. reaffirm its recognition of Pride Toronto as a significant cultural event that strongly promotes the ideals of tolerance and diversity, but condemn the use of the term ‘Israeli Apartheid’ which undermines these values and also diminishes the suffering experienced by individuals during the Apartheid regime in South Africa. “The real, real battleground is revising the anti-discrimination policy,” said Pasternak just after the vote was taken. Those revisions, he hopes, will preclude the term “Israeli Apartheid” figuring in future debates at City Hall, by rendering it in clear violation of a new anti-discrimination policy. Last year, City staff researched the subject and concluded that “Israeli Apartheid” did not violate the existing policy, triggering a request for revisions to it. Those proposed revisions came from staff within the past week, however, and they contain no specific mention of the term nor any clauses that seem to render it discriminatory. When asked whether or how council could ensure that “Israeli Apartheid” was specifically captured by an anti-discrimination policy, Pasternak said he believed that it would be covered if the policy looked at the “intention and phraseology” in language use. (He maintains that “Israeli Apartheid” is a term that promotes hatred.) “We don’t want world conflicts here; people come here to avoid world conflicts,” he added. Pride Toronto, along with other major cultural organizations, did receive its funding today; after passing the above motion councillors passed the grant allocations unanimously. Notably, that funding is not contingent: Pride will get it whether or not QuAIA shows up. It will take a bit of time though, to see whether the issue has been put to rest.